Ten years ago, I spent the summer living in the town of Beit Sahour, a Palestinian town just 10 minutes east of Bethlehem. Now there are two fields in Beit Sahour that are claim to be the actual Shepherd’s field where the angels first brought their joyous news for all people. One of the spots is claimed by the Greek Orthodox Church, the other by the Catholic church. The home that I lived in for the summer sat right on the edge of the Orthodox Shepherd’s field…and, of course, it was explained to me that that field was the actual, historical location. I lived with the Rishmawi family. My room was on the first floor, with Georgette and Saliba, the patriarch and matriarch of the Rishmawi family. Nidal (one of their sons) lived on the second floor home above them, and their eldest son, George, and his wife Muna lived on the top floor. This is common in the Middle East, that family would live together in the same building. Often a couple would start with a one floor home, and then a son or daughter would build a second story, and live in that. And then another family member would build a third story and live in that, and so on. Family is so important in middle eastern cultures. It didn’t matter if I was coming home from a barbecue or someone else’s place where we had previously already had dinner – she had to feed me. And if I said no – well, I couldn’t say no. It would have been an insult to her – it would have been turning down her hospitality. And it wasn’t just Georgette…everyone we met was so hospitable. Every home we visited, we were invited in for coffee. And you have to drink a cup of coffee when it’s offered – it’s a way of accepting the hospitality of these strangers who don’t feel like strangers after a few minutes of conversation, sitting around their living room. A group of about 15 of us internationals visited an extremely poor, blind Palestinian man and his family who lived outside of Hebron in a one-room home…and he and his wife ushered us all in – made sure we were all comfortable…and of course, made sure we all had a cup of coffee. If any of you have been to Palestine or Israel, or any middle eastern country – you have probably had some of these same experiences – and you know the hospitality that I’m talking about. I share all of this simply because…I guess I don’t really believe Luke’s account of how this all went down. If a woman, about ready to give birth had approached anyone who I met in Palestine or Israel…any of those families who lived in Beit Sahour or Bethlehem…it is highly unlikely that they would have been turned away. That would have been both inhospitable and unimaginable. And so – as I read this story tonight – this story that I’ve heard every year for the past 34 years of my life…I just don’t think that I buy it anymore. I don’t buy the fact that an innkeeper turned a pregnant Mary and Joseph away, and sent them to an outdoor barn. Certainly not – especially not if Joseph was of the house and lineage of David. That innkeeper would never have been able to forgive himself. In his book “Jesus Through Middle Eastern Eyes,” Kenneth Bailey, who is the Canon Theologian of the Episcopal Diocese of Pittsburgh, says that such an innkeeper – such an inhospitable person – could not exist in a society that placed such importance, such worth, on hospitality. Most people at that time probably lived in a one-room structure – in that room there would be space for living, and sleeping, and probably a fireplace of some sort. In addition to that, the “stable” was actually the space in that same room where the household animals were kept overnight. And what separated the animal “stable” and the family living space? Mangers. Feeding troughs for the animals who were inside the home. Now for those families who were lucky enough to have one, a kataluma was an extra room in their home – a guest room – which could be rented out – and certainly would have been during this time when everyone was returning to their own cities, and Joseph and Mary were returning to Bethlehem. Because we are told that the guest room was full, it is quite possible that Mary and Joseph were graciously invited into the family living space of a home, perhaps the family were even relatives of Joseph’s – and there Mary and Joseph stayed with the other family members. Mary gave birth and then wrapped Jesus up and placed him in a manger in that same room. Our traditional reading of the Lucan narrative has us imagining a harsh innkeeper who saw a pregnant woman about ready to give birth…and said, “Hey – sorry – we’re all booked up. Go sleep with the animals in the barn…” As our Middle Eastern brothers and sisters read this story – you can imagine they are appalled at how their culture is portrayed. They can’t fathom anyone doing what the innkeeper supposedly did. And we have since romanticized this harsh act of inhospitality by speaking of the “lowly and humble estate” of our savior and picturing the stable as a tranquil and beautiful place for the birth of a baby boy. But really…it’s quite possible that this isn’t a story about inhospitality shown to a couple…rather it’s a story about a simple, yet powerful act of hospitality. There was no cruel innkeeper – just a peasant family who saw a couple in need and opened their arms to welcome them – opened the door to their family’s home and living space, and made room for the birth of the Savior. The Savior, the Messiah, was born among common people – among generous, hospitable people who even welcomed the shepherds into their home for that special occasion that night. If we view the birth story through this new lens, this lens of hospitality, we see that a simple act of grace and generosity and hospitality is what allowed the very presence of God, Emmanuel: God-with-us, to be incarnated into our world. Hospitality and generosity births love into the world. Now, did the family know they were welcoming the savior of the world into their midst? It’s doubtful. But that makes it even more beautiful. Without knowing, without asking questions, without the expectation of something in return…they extended generosity to this couple. And in so doing, played a key role in one of the greatest stories ever told. Clearly when we do those things, we are in a cosmic sense, participating in that birth story that happened on this night, so many years ago. We are participating in a timeless act of hospitality that births love. 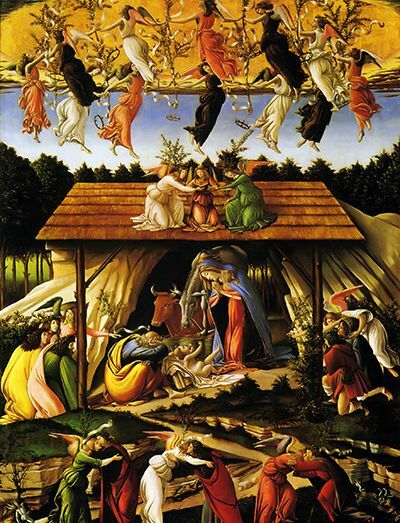 The question for us this evening…is how will we welcome in the birth of the Christ Child? Through your lives – how will you help usher in this most magical of evenings? Will you open the doors of your home to the traveling couple who are about to give birth? Might you extend gracious hospitality to that family member who is always able to say or do something that just drives you crazy? Can you look at someone whose skin is a different color than yours, who speaks a different language than you speak, or worships a different God than you worship…can you look at them, recognize you’re both children of God, and find ways to birth love through generous acts of hospitality? Will you make room in your home this evening? Though the guest room may be filled – will you rearrange some furniture, lay out some extra cushions and blankets…and will you open your arms to whatever it is that God has in store for you? Will you participate in a holy act of hospitality that will birth love into this world? For if we are able to do so…we…all together can work to bury this idea of the harsh innkeeper – these ideas of cruelty and inhospitality being part of our story this evening…and we can focus on hospitality, and the gracious love that is both shown to the Christ Child, and embodied in the newborn babe, wrapped in swaddling cloths, lying in a manger. 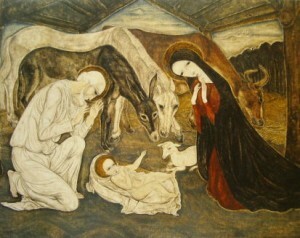 Not out in the harsh cold, surrounded by dirty animals and smells that you would only associate with an outdoor stable…but wrapped in swaddling cloths, lying in a manger…in the warmth of a home, surrounded by a family that loves him, strangers who welcomed him in…and yes, probably still a few animals. For just as the Christ Child was welcomed in through an act of hospitality – so we receive the ultimate act of hospitality and generosity – as we are given the gift of this Christ Child…the one who will ultimately welcome all. This was such an interesting read, and I would have never thought of this on my own! I love when Pastors break down stories from the Bible so that we understand their modern equivalent. I think that is so important. Thank you and God Bless. Understanding the cultural context of the Bible brings clarity that cannot be gleaned from reading the text in English from a 21st century Western Worldview. It’s a great thing that pastors are finally getting this. Reading the text the way its been mistranslated for over 1800 years gets us lost. Thanks for your contribution!